Bubbles is a relaxed grooming environment and every dog’s wellbeing is important to us. If dogs could talk, they’d choose Bubbles everytime. 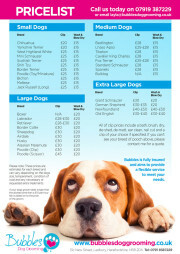 For a pet trim or for a full breed standard clip, book your dog in for a full groom. This includes bath, blow-dry, de-matting/de-shedding if needed, styling (clip or scissor), sanitary clip, nail cut, ear clean (and plucking if needed). Sick of your pooch malting all over your house? De-shedding is perfect for removing all of your dogs dead hair so will minimise the amount they shed. This is popular for breeds with double coats who shouldn’t be clipped. Claw cutting is available for £2 per dog or is included free in a full groom and is free in between grooms for regular customers. There is an extra charge for de- matting. Animal Welfare Guidlines state that de-matting can only take place for a maximum of 15 minutes. If your dog requires longer than this to become matt free I will clip the dogs coat off under the matts to prevent pain and discomfort. I have lots of experience working with nervous and aggressive dogs. My aim is to ensure that each and every dog that leaves Bubbles has a waggy tail and has enjoyed their experience. To achieve this I will work with you and your dog to reduce the stress they feel when going to the groomers. For more information or to chat about what I can do to make you pooch more comfortable feel free to contact me. How much does it cost for my breed of dog? 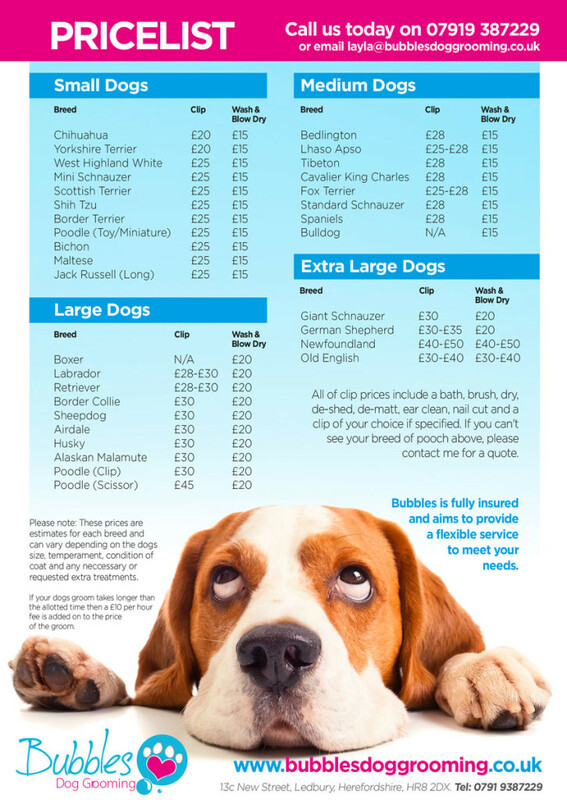 View our complete price list here to see more details.